I’d like to take this opportunity to wish all of you a very happy and healthy holiday season. I know that for many of us, the holidays evoke many emotions, memories and stress that we’d rather do without. That being said, the holidays are upon us and we have to deal with them, whether we want to or not. There are gifts to be purchased, cookies to be baked, families to visit, tears to be shed and laughter to be had. A few weeks ago, my family and I had the opportunity to appear on Anderson Cooper’s new daytime talk show about “Surviving Loss”. I hope that some of you were able to watch the episode or at least see the clips I posted. The show featured Anderson and his mother, Gloria Vanderbilt talking about the death of Anderson’s father of heart complications when he was just 10 years old and the subsequent death by suicide of Anderson’s brother, Carter when Anderson was 21 years old. In this episode that aired on November 7th, we talked about the holidays and the special new traditions we have since experiencing our loss. My son Kyle, who is just 12, told Anderson that although the holidays and special occasions are tough, that getting out there and celebrating his father in a fun way helps us to honor his memory and makes him feel good. Last Christmas was our “first”. I remember taking the boxes of decorations out of the garage and dreading opening the one that I knew had our Christmas stockings. I had been beating myself up with the dilema of what to do. You see, I am the type of person who has to deal with things as they come up. I knew that once I took his stocking out of the box, I was going to have to make a permanent decision; either decide to keep hanging it year after year or not. It took me a few days, but I finally decided that if I hung it up, I’d then have to figure out if I was going to fill it or leave it empty. And if I filled it, what would I fill it with? And who would empty it? All of that uncertainty didn’t sit well with me so I decided that his stocking would not go on the mantle. Oh the guilt was terrible. Was I disrespecting his memory? What would the rest of my family think? Would the kids expect it to be there? So many questions and doubts yet I knew in my heart that not hanging it was the right thing to do for me and my kids. Why, you ask???? I think these types of decisions are personal and I’d never think anything less of a parent who decides otherwise. I just knew that for me and my kids, I needed to focus on celebrating the holiday remembering their father in a different way. We couldn’t pretend he was still with us. We couldn’t fill his stocking with things he would never see. We had to move forward and through the holiday remembering and respecting him in a very different way. I remember the day I sat at my dining room table holding his Christmas stocking. Christmas was Jeff’s favorite holiday. The minute the radio stations starting playing Christmas music, his radio was tuned in. He would sing Christmas Carols throughout the house from Thanksgiving on and was the first on the block to get the lights and decorations out. I knew that, my kids knew that, the neighbors knew that, and his family knew that. So as I sat at the table that December afternoon, holding his stocking, an amazing idea came to me. Why not share something that Jeff loved so much with the rest of his family? I went to the kitchen and grabbed a pair of scissors, and trying not to think too much about what I was about to do, I sliced right through the middle of his Christmas stocking, cutting it in half. I grabbed a piece of my daughter’s construction paper and marker and traced the shape of a heart. That was my template for the ornaments I was about to make. I cut heart-shaped pieces from his stocking that had hung at our house and the stocking he had kept from his childhood home and went to town. 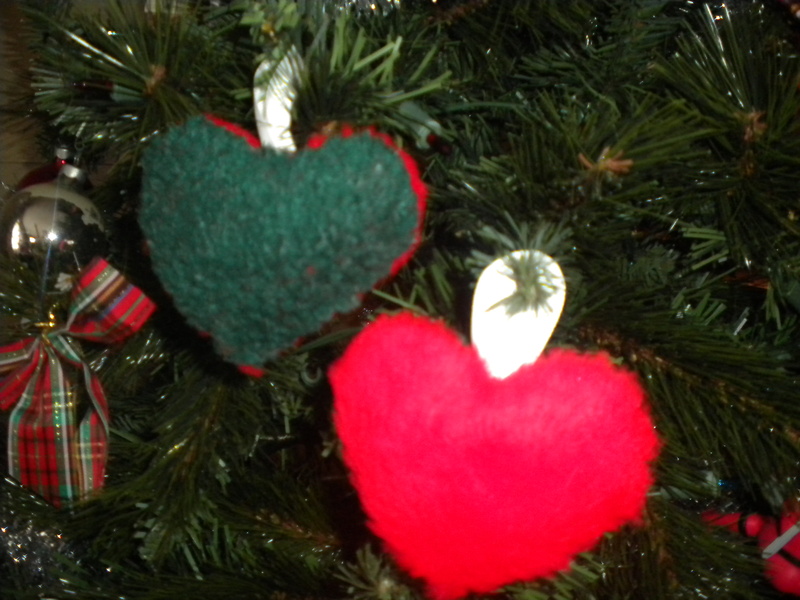 Now that I had a goal, what would I stuff the heart-shaped ornaments with? It didn’t take long to figure that out. I ran to our bedroom and grabbed his favorite pillow, a.k.a “woobie” and cut that open too. I remember thinking, “What the hell am I doing???? ?” I’m cutting my husband’s Christmas stocking and taking the stuffing from his favorite pillow and it’s all over my dining room table!!! The idea of making ornaments for our family made me feel so good but I was also wondering at the same time if I’d be regretting this someday. I finished the ornaments and shared them with our family members. The kids and I wrote a nice note explaining that we wanted to share the things that meant the most to Jeff with them. We wanted them to have the things that meant so much to Jeff and have it year after year after year. He loved Christmas and he loved his “woobie” and now every year, our family members can hang that special piece of him on their trees. It was such a difficult, yet such a rewarding experience for us that I know that every year that we hang his special ornament, it will mean so much to all of us. His love for Christmas will continue to remain with us. So this year, I proudly took the ornament out of the box that holds our stockings and let the kids hang it with pride. They know their dad is always with them and putting that ornament on the tree only reinforced that feeling. So as we enter into this holiday season, I’d like to know what are you doing and what special traditions have you started to remember your loved one? Sharing our stories is important and I’d love to hear about the special things you do during the holiday season. Please feel free to share them below.